We have well-developed facility to fabricate CI Body Treadle Shearing Machine. The entire production procedure of CI Body Treadle Shearing Machine is supervised by experts. Our CI Body Treadle Shearing Machines are excellent not only in terms of fabrication and performance, but price as well. The CI Body Treadle Shearing Machines can be acquired at economical price from us. Robust and streamline construction is developed and designed after manufacturer's extensive experience in manufacturing and sales of such machines. The Accurate Cast Iron Body & M.S. 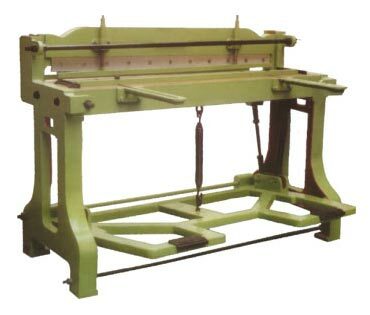 Body Treadle Shearing Machines with best workmanship. The machine is having wide application in industries like Drum, P.P. Caps, Calendar Rims, Tube Light Patti, Electrical Stamping / Laminations, Electrical Fittings, M.S. & Steel Cutting, Electronics, Laminates, Control Panels & Boards, Barrel, Brass, Aluminum, Tine Containers, Block Makers and other fields. Streamline and rigid structure ensures fatigue less and vibration-free working of the machine. Machines are fitted with OHNS quality Four Edge Shearing Blade to avail maximum use of blades. Upper Beam/Ram moves in C.I. Guide ways with accuracy bearing surface and having fine-tuning for compensating wear and tear. The extra heavy duty Treadle with proper weight is spring loaded and very ingenious for operator's convenience which takes minimum pressure while cutting. The springs fitted are of proper compression and strength. Modifiable front & back gauge with through slots which facilitates adjustment of different widths of cuts and avoids any sorts of waves and twisting of sheets while cutting. The setting bolts are provided for lower-fixed blade to adjust vertically when height of blade is reduced following re-sharpening. All lubrication points are provided with lubrication cups at required places to ensure smooth, simple and longevity of machine.